The opener against Auburn was a given. But also lurking with almost as much potential difficulty was the Huskies' Pac-12 Conference opener: at Utah, at night and against an opponent that has given Washington fits in recent seasons. "We're going to an extremely hard place to play, harder than where we played back East because we're truly on their campus, a team that is super well coached and is going to be one of the better teams in the country when it's all said and done," Petersen said. 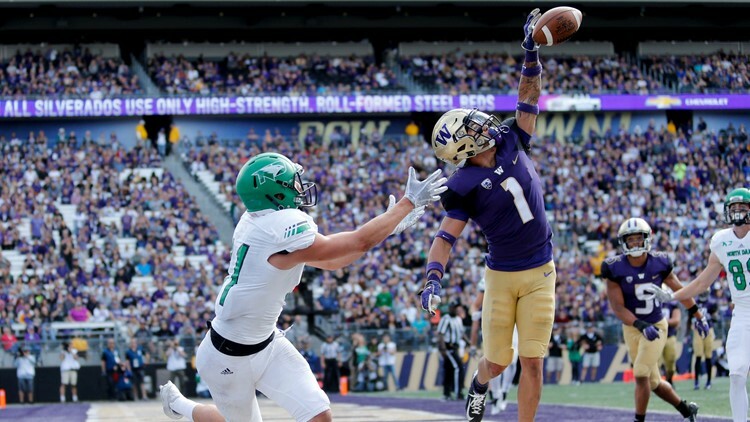 Washington is coming off a 45-3 win over North Dakota during which it couldn't have looked more unimpressive for stretches on offense, especially with its running game. Utah (2-0) slogged through three quarters against Northern Illinois before Chase Hansen's interception return for a touchdown with 2:36 left help lift the Utes to a 17-6 win. "We know we didn't play our best football yet, but Pac-12 play is here and we're ready to go," Hansen said. What's in store this time? "We can stand toe-to-toe with them and play with them, and that is something that should give us some confidence," Whittingham said. "We have had some rough finishes with them and we've also been able to come away with a victory. We've just got to be able to finish the deal. It was the punt return a couple years ago and then, last year, letting them out of their own territory and me calling a timeout trying to give our field goal kicker an opportunity, just some things that didn't worked out in our favor. We've played them very well and we got to find a way to get over that hump." WHICH JAKE: Washington QB Jake Browning threw for more than 300 yards and two touchdowns in just three quarters last week. He also threw two poor interceptions and missed several open receivers. The inconsistent performance against an FCS crew followed his shaky fourth quarter in the season-opening loss to Auburn. Browning knows he must be better going forward for the overall efficiency of Washington's offense. "He finds a weakness in the defense and, even at times when you have things locked down, I feel like he's really good at improvising, getting out of the pocket and making plays," Hansen said. NO BIG PLAYS: Utah hasn't played the most dynamic opposition yet, but the Utes have yet to allow a 20-yard play on defense, either passing or running. The longest play against Utah's defense was a 19-yard run last week by Northern Illinois. Perhaps most impressive, the Utes are allowing just 2.2 yards per rush. OFFENSIVE PUNCH: Scoring just 10 offensive points in a win over Northern Illinois heightened concerns about Utah's offense. Tyler Huntley threw for 286 yards, but the Utes punted five times, turned the ball over twice and had just 68 yards rushing. "Everything was there. It's just a matter of executing. If we convert two of those third downs, it's a whole different ball game. We get more in the red zone and we don't get as much penalties, it's a whole different ball game," Huntley said.